Vincent by Don McLean is a classic song of its time, still gets regular performances around folky settings and seldom leaves an audience dry eyed. 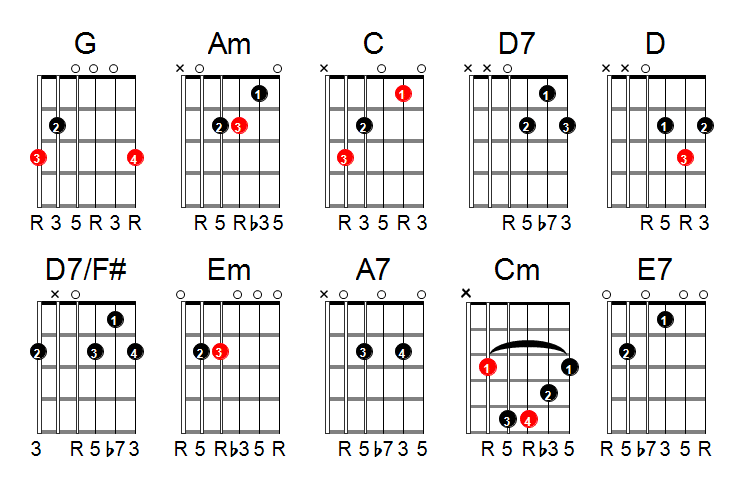 It’s a pretty easy one to play in terms of chord shapes, but there’s plenty you can do with it in terms of ‘finger picking’. It’s a good example of taking a set of simple chords and using standard embellishments to form a more interesting accompaniment. But it’s also a weird one because Don doesn’t stick to standard numbers of bars. Very often when an audience tries to join in with the song things get very out of time. This is because instead of sticking to the standard 4 bar lumps usually used for pop music he drops bars. His focus is purely on the lyrics. But people expect music in 4 bar lumps, so when this one is played people don’t know when to come in with the next line. But hey, he wrote the song on a paper bag! He also uses a lot of rubato – stretching the beat lengths to give greater musical expression. A good solution might be to come up with some guitar work to fill out the missing bars. Here we present the version as it occurred on the album. Vincent is a simple structure. There’s no intro or outro. Three verses and a bridge. All you need to express the lyric with sufficient variation for interest. The chorus has the classic G – D/F# – Em move and the brief move to the D major (dominant modulation) given by the A7, then the Beatlesy A7 – Am. Lots of good tricks. The bridge starts with the same progression as the first line of the chorus. Line 2 has a iv (a minor IV chord) which takes us into Cm (melodic minor to my ear), then E7 (key of A) and then back to G major. This gives a great strength to the harmonic movement, ideal for a bridge section. There are 4 beats to the bar in this one, mostly, depending on how he was performing it that day. Of course he was fingerpicking his guitar, not strumming it. If you want to have a go at the fingerpicking version have a look here. OK, Justin’s technique and posture are all over the place, but you’ll get the idea. listening  still,                Perhaps they never   will.